It’s a big challenge not to miss something really important having an enormous database with records. To avoid that problem, one may use a Stream to see all the updates and changes to the records you choose to follow. Where to start? First of all, you have to know that there are two kinds of a Stream. 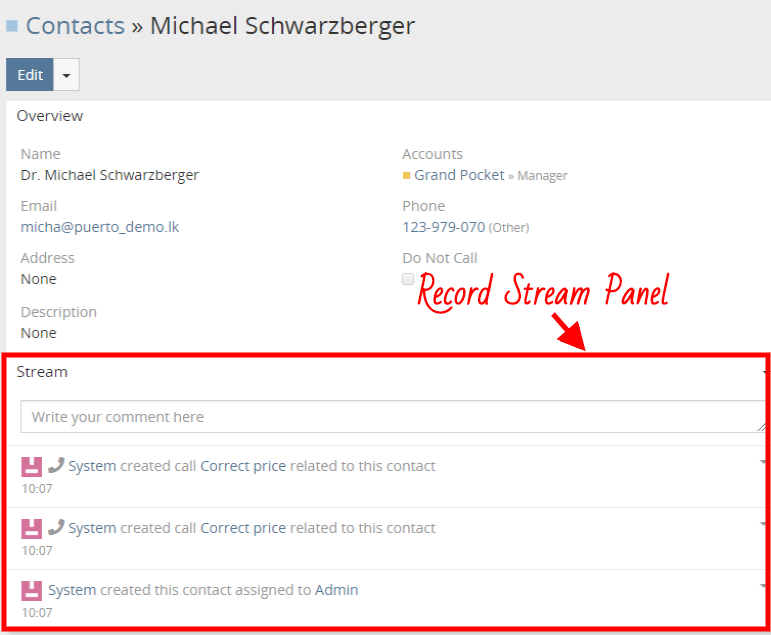 Record Stream is available by default for Accounts, Contacts, Leads, Opportunities and Cases. It can be found in the Stream Panel on the detailed view of a certain record and there you may find posts concerning updates and changes to a certain record. User Stream is available in Stream dashlet and under Stream tab. It provides a user with the information about changes and updates related to records the user follows as well as with the posts addressed to that user. You can configure your User Stream according to your liking by clicking drop-down menu at top right corner. 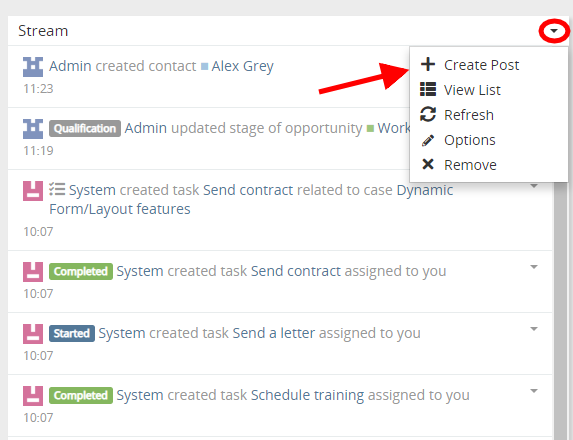 To create a post in a User Stream, choose Create Post option. As you can see, you are able to attach different types of files to your post (photos, PDF and Excel documents etc.). At the same time, your post may be directed to a particular person or team, or even to yourself. In order to mention a particular person in a post, you may choose him or her from the list or type @ and the name of a person. The person mentioned in your post will receive notification about it. To find out more information on text styling of a post, see here. Moreover, you are able to choose the information that will be shown in a Record Stream, running a filtering tool by clicking drop-down menu at top right corner, which is extremely convenient if you want to find out a specific piece of information or when you’re interested only in posts or only in updates.